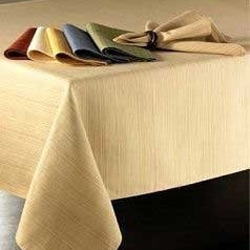 Manufacturer of a wide range of products which include table napkins and cotton table cloth. We are one of the best organizations in the market, involved in offering a wide range of Table Napkins to the customers. These table napkins are manufactured in best production unit using optimum input factors. We are offering this product in superior colors and designs in standard packs of bulk amount too. Our offered collections are unique, advanced, soft, widely used and are provided to the various clients at reasonable market price range. We are offering an elite range of Cotton Table Cloth to our patrons that are designed and manufactured using premium quality cotton as per the set industry norms. We source the cotton from most reliable vendors who are well versed with our high quality standards. Our offered cotton table clothes ranges are offered in exciting colors, alluring prints and various sizes, designs and color combinations. 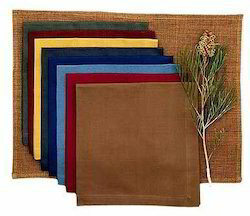 These table clothes are highly durable in nature. We are offering this range in market leading prices.